Delegates to the Regional Assemblies will vote for the offices of President, Vice Presidents of Education and of Public Employees, NEA Director and our NDU delegates to the National Education Association’s Representative Assembly. 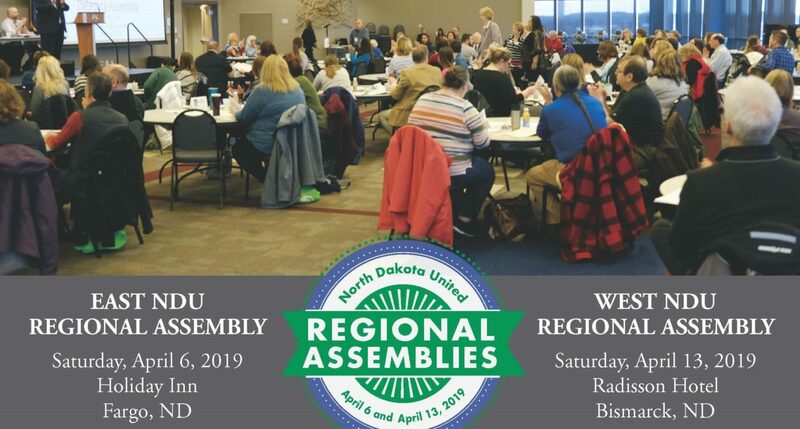 The exact agenda was still being developed at the time United Voices was going to press, however we will host a legislative forum, an NEA training on implied bias, organizing and communications trainings, a North Dakota Public Employee Retirement System (NDPERS) update, and more. West — Radisson Hotel (605 E Broadway Ave., Bismarck, ND 58501) Phone: 701-255-6000.